how can I calculate the percentage of overlapping regions of two distributions? I suppose this problem has a specific name, are you aware of any particular name describing this problem? Are you aware of any implementation of this (e.g., Java code)? For this example, the result is: 0.6099324 with absolute error < 1e-04. Figure below. This is given by the Bhattacharyya coefficient. For other distributions, see also the generalised version, the Hellinger distance between two distributions. I don't know of any libraries to compute this, but given the explicit formulation in terms of Mahalanobis distances and determinant of variance matrices, implementation should not be an issue. First, you find the intersection points between the two densities. This can be easily achieved by equating both densities, which, for the normal distribution, should result in a quadratic equation for x. This can be solved with basic calculus. Thus you have either zero, one or two intersection points. Now, these intersection points divide the real line into 1, 2 or three parts, where either of the two densities is the lowest one. If nothing more mathematical comes to mind, just try any point within one of the parts to find which one is the lowest. Your value of interest is now the sum of the areas under the lowest density curve in each part. This area can now be found from the cumulative distribution function (just subtract the value in both edges of the 'part'. At least I could reproduce the value 0.8026 given below Fig.1 in this pdf. You just need to adapt the start and end and interval values to be precise as this is only a numerical solution. Not the answer you're looking for? Browse other questions tagged normal-distribution similarities metric bhattacharyya or ask your own question. How to calculate overlap between empirical probability densities? 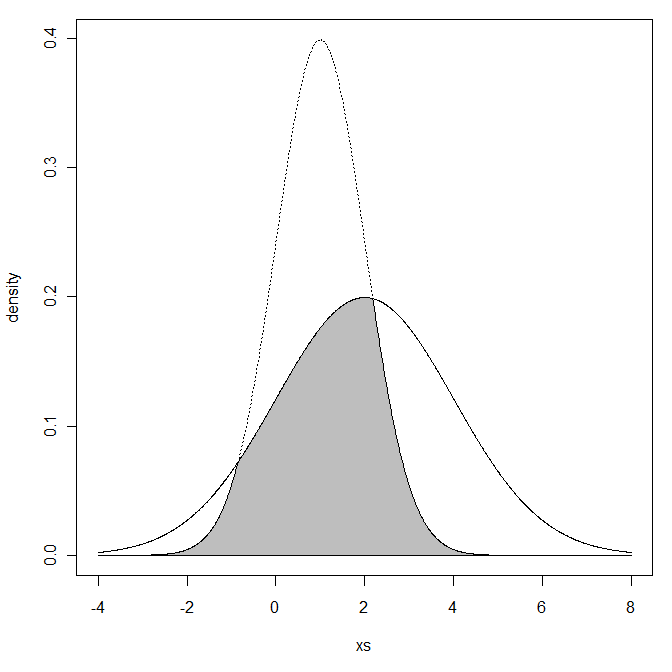 Given a draw from one of two overlapping normal distributions, what is the probability it came from one vs. the other?